Ascenders, together with descenders, increase the recognizability of words. For this reason, many situations that require high legibility such as road signs avoid using solely capital letters, the all caps style. Studies made at the start of the construction of the British motorway network concluded that words with mixed-case letters were much easier to read than "all-caps" and a special font was designed for motorway signs. These then became universal across the UK. See Road signs in the United Kingdom. 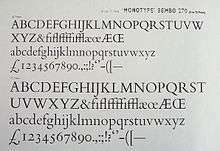 The font Bembo in metal type. Ascenders such as the 'f' stand far above the cap line. In many fonts intended for body text, such as Bembo and Garamond, ascenders rise above the cap height of the capital letters. ↑ Sampson, Geoffrey (1985). Writing Systems: A linguistic introduction. Stanford, California: Stanford University Press. pp. 94–95. ISBN 0-8047-1254-9. ↑ Slimbach, Robert. "Using Acumin". Acumin microsite. Adobe Systems. Retrieved 6 January 2016.